Homepage. This page: Some more of my motoring sites. Old Classic Car is the largest old-car site that I run, those below are mostly specific to particular makes or model of vintage car and truck. There are also a couple of modern-car related websites dotted around too, plus a vintage aircraft entry for good measure. 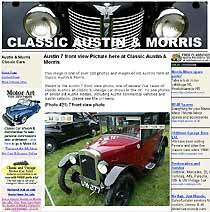 Classic Austin & Morris is an image gallery showing loads of restored and unrestored Austins and Morrises. Examples shown date right back to the 1920s and 1930s, and continue through to the postwar Austin saloons and Morris light commercials that were producted in the postwar 1950s, 1960s and the gloomy British Leyland days of the 1970s. 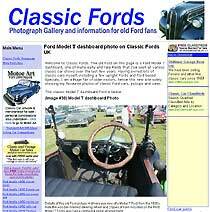 Classic Fords contains loads of photos showing many different models of Dagenhams finest. Early stuff such as the Model A and T featured on Classic Fords, as do later sit up and beg Pop and Prefects, 100Es, Corsairs and Cortinas. Loads of piccies for the old-Ford enthusiast. Classic Jaguars contains photos of classic Daimlers and Jaguars from the earliest SS saloons, via legendary saloons such as the Mk2 and XJ ranges, sportscars such as the XK and the E-Type, and one or two Jag-engined specials, to early 1980s BL cars such as the Series 3 XJ and the XJS. Competition cars also feature strongly within this image archive, both original cars and those now used in historic racing. 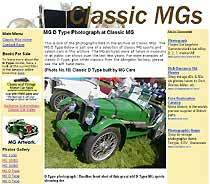 If you're a fan of small sporting cars from Abingdon, the photos at Classic MGs may be of interest. There are vintage and classic MG saloons and sportscar shown here, some of which are prepared for competition use, whereas others are daily use classics or concours competitors. Collectors of old pickup trucks might like to look at Classic Pickups as it features 130 images of various pickups, both in the UK and overseas. Articles regarding these interesting old haulers will be added in soon. 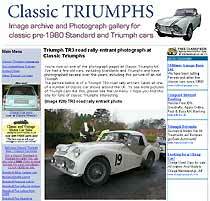 Classic Triumphs is a photo gallery showing both sports and saloons from this historic Coventry manufacturer. Sports, light vans, and saloons all feature from Triumph, alongside some shots from 'Standard', before that name disappeared altogether from motor manufacturing in the early 1960s. Road and track cars feature. Classic Wheels is another, smaller, site in a similar vein to oldclassiccar. 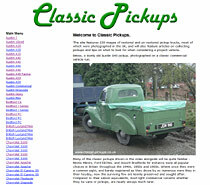 However the content in unique, and contains further general images of old cars, some more period pics sent in by visitors to the site, and a series of articles about choosing a classic, sent in by Tom, a dealer in older cars who lives in the USA. Dodge Trucks is a simple register for owners of Old Dodges in the UK to register their lorries. 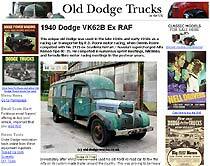 Although military variants do get a mention, this site is mainly aimed at owners of civilian styled Dodge and Fargo trucks based in the UK, although some examples that are owned overseas do get a mention too - no strict rules here! Incorporating an international owners register, the Ford E83W site is the only online resource solely aimed at owners of this van and pickup range. There are photos, period road tests, brochures & handbook scans, period working vans, rare vans still in use overseas, and details of the latest E83W 'finds' across the world. A series of restoration articles is being added too. 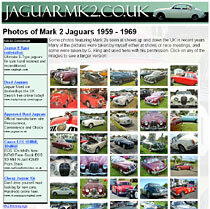 Published in 2006 is the Jaguar Mk2 website, devoted solely to what is perhaps the classiest of all Jaguar saloons. 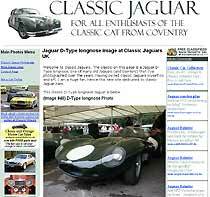 Initially the site has the following content - photo gallery, free screensaver featuring Mk2 Jaguars and the Daimler V8 250, and a free noticeboard for advertising Wants and stuff For Sale. 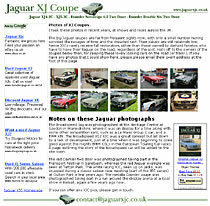 New in 2008 is this site covering the Jaguar XJC Coupes, in both Jaguar and Daimler form, powered by either the straight 6 XK engine, or the legendary all-alloy V12 of 5.3 litres. 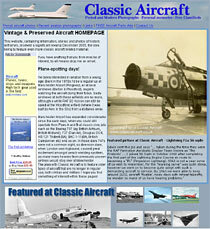 Classic Aircraft is a large photographic archive of pre-1980 aircraft, photographed at museums, airshows and airfields up and down the country. In addition to the views of preserved airframes, there are also plenty of period black and white images sent in by various people who have an interest in older types, many of whom flew these early fighters and bombers after the war. Morris 8 Series 1,2 & E Morris Eights.